Free to Be Me: New Look! I have changed up my blog as you can see and I love the new look. The barn is in Indiana and is almost around the corner from where we were staying on the lake. I saw it last year, but never got a chance to take a picture of it and so I made sure to carve out some time this year! To me, it is the prettiest colour barn I have ever seen...understated elegance...if a barn can possess such a thing! I don't think I have ever seen another barn this colour, but if I had a barn I would want it to look just like this one! It is so serene looking to me and just makes me smile when I look at it! We had a wonderful vacation and I came back ready to meet life, and all it holds, head on. I feel refreshed and rested and am so thankful to have everyone back under the same roof again! 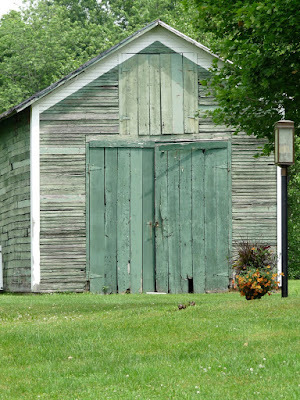 I sorta collect barns (prenup with my husband to limit them to the kitchen decor) but have never seen one like "yours". Thanks for sharing! ps: Finally got a chance to tell your hubby's friend Scott Kennedy that he said "Hi". Scott was floored how we know each other. Fun moment! Love the new look and that barn is fabulous! !